Flight Report – That 70s Plane: Flying The UTVA 75 Trainer | Achtung, Skyhawk! Ever since the early days of Achtung, Skyhawk!, I’ve always been on the lookout for rare, interesting and historically significant aircraft puttering around the region – you know, the sort of machines that had it all really: rarity, backstory and a rich history to boot. As the winter’s soaked runways, persistent fog and oppressive low cloud finally gave way to dry grass, pleasant temperatures and clear sunny skies, I decided I might as well go one up this time and actually – fly one 🙂 . Having spent my formative flying years listening to “oldtimers” and their stories of adventure on the many aircraft types indigenous to former Yugoslavia, the choice made itself really, especially since many of them are nowadays well up on the endangered list. 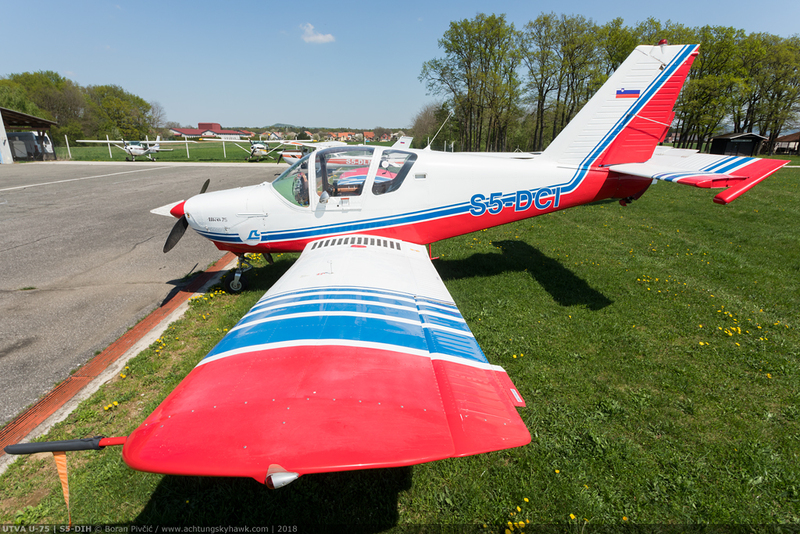 The simplest solution was thus to go for the most modern and popular one, which eventually led me to Slovenia’s Maribor Airport (MBX/LJMB) and its resident UTVA U-75 two-seat trainer. The shape that launched a thousand student traumas… while it certainly won’t be winning any beauty contests, the U-75’s stocky build and generous size nevertheless make it stand out among its peers! Author’s note: given that I have no experience flight testing aircraft (nor do I have the required skills or qualifications), this work is not a proper professional review – but rather the personal experience of a long-time light aircraft pilot and lifelong GA fan. As such, my observations will definitely not be something they will print in textbooks – but given the rarity of the U-75, they should nevertheless be an interesting read for the enthusiast! Even though the U-75 had already featured here in depth as part of a review of the type’s sole surviving four-seat example, for the sake of clarity and ease of reading I though it best to nevertheless run quickly through some of its more pertinent characteristics. Flying for the first time in 1976, the U-75 is a simple and robust all-metal semi aerobatic two seat trainer, designed to be suitable for everything from basic flying instruction (civilian and military) to initial aerobatics and even air-to-ground gunnery. Despite its not inconsiderable bulk, the U-75 weighs only 685 kg empty and 1,200 kg at maximum take-off (though it is usually flown at its maximum landing weight of 960 kg), which makes its 180 HP Lycoming IO-360 and its associated two-blade constant speed prop good for about 115 kts in the cruise. More importantly, its +5.5/-3 G stress limits with one person on board (and +4.4/-2.2 with two) give it a wide berth during maneuvers, while the tall wide-track landing gear, long-travel shock absorbers and large low pressure tires make (student) landings a doddle even on rough and unprepared strips. With 138 examples made in total between 1978 and 1985, the U-75 would go on to become former Yugoslavia’s second most produced indigenous design – right behind the G-2 jet trainer – and was throughout the 80s and 90s used by civilian clubs and air forces across the land (in the latter often known as the V-53). And while it is today viewed with fond nostalgia, its life in service was much tarnished by a popular reputation for violent spinning (sometimes fatally), which bred considerable distrust in the design. In fact, the problems stemmed from the rearward position of its center-of-gravity, which made it a peppy and nimble performer – but at the expense of reduced longitudinal stability*. When pushed hard and then poked with a stick, it would indeed want to spin and keep on spinning; but when flown in moderation and per SOP, it had shown itself to be pretty docile in all flight regimes, a fact attested to by numerous operators who went aerobatic on a regular basis and without incident. But, first things first. Entry into the cockpit is pretty straightforward and is standard stuff for low-wing aircraft: hand in recessed handle, foot on step and up onto the wing from behind. However, since the U-75 was designed from the outset to operate out of unprepared strips, the wing root is a good 80 cm above the ground, so the whole maneuver requires a bit of gymnastics – though not much more than trying not to trip over the 172’s main gear leg. Once on top, the two-part sideways hinged canopy (jettisonable in flight) opens upwards, and is then fixed in place by a manually folding arm tucked on the inside of the canopy frame. The setup is not really ideal for tall people (like me), since it is quite easy to bang one’s head against the canopy while maneuvering to enter the seat. Thankfully, the canopy is pretty large overall so – heads notwithstanding – getting in and out of the cockpit is not difficult or haphazard by any measure. While it is immediately obvious that all structural components and cockpit controls are built to last – everything feels decidedly more robust and durable than on the 172 – the overriding impression is of rudimentary finishing work, with rough and unprotected edges in abundance all over the cockpit. Admittedly, given the U-75’s military nature, comparing these and other creature comforts with those of the Skyhawk is apples to oranges – but despite the lack of padding and soundproofing and any form of interior trim at all, the cockpit is physically very comfortable and quite airy. Headroom however is slightly less generous than on the 172 (even when you lower the seat fully), and anybody over 1.8 m and wearing a headset will fill slightly hemmed in from above – though it is still manageable and not much of an inconvenience on shorter flights (under two hours). While there are no basic Ts and sixes here, the U-75’s cockpit is in some respects pretty well though out, with a couple of good ergonomic touches. One in particular is the central pedestal, which contains pretty much all system controls, including the throttle (yellow lever), propeller control (blue lever), mixture control (plunger), alternate air source (red-topped plunger), demist controls on the side, parking brake (orange switch) and, out of shot, the fuel selector (which, like on the 172, has a very welcome BOTH setting). One particular level that is missing – and would have been fitted in the hole below the alternate air – is the underwing stores emergency release handle. 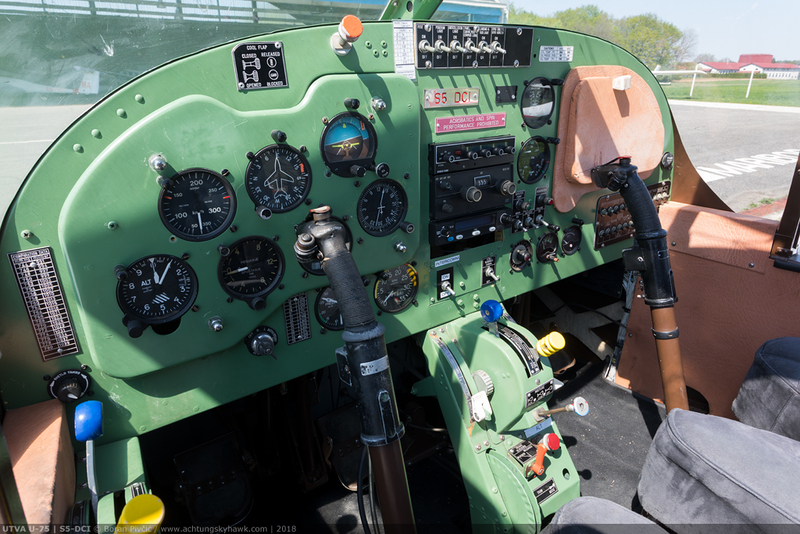 Like many trainers, the U-75 also includes another set of throttle and prop controls on the left of the pilot’s seat. 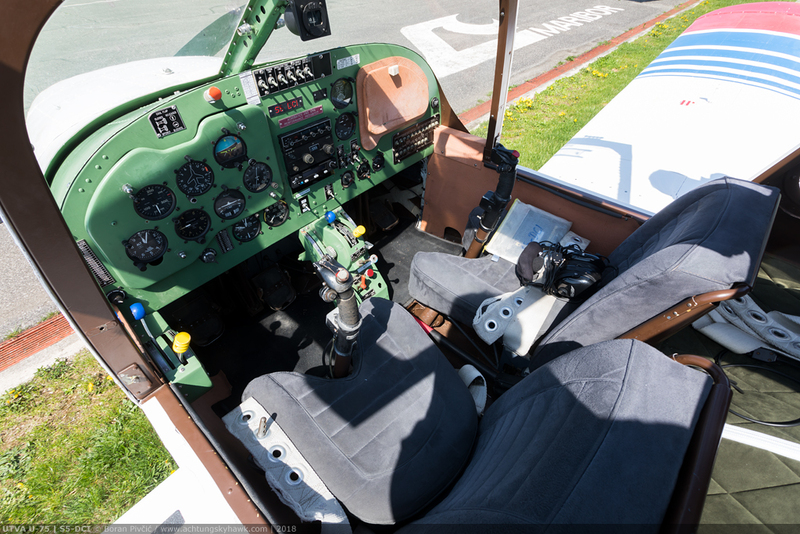 Absent from the shot is the flap level, a large Piper-like affair between the seats; its settings are simple, UP, notch 1 (take-off and landing) and notch 2 (landing only). For my taste, the sticks are of perfect height – not to low, not to high – and though they’re designed to accept either hand, they fall slightly more easily into the right. The only really annoying feature is that on both throttle quadrants the prop control is on the left and the throttle on the right; whereas the manifold pressure gauge (controlled by the throttle) in on the left and the RPM gauge is on the right. As is the norm for all Yugoslav designs, the flight instruments are all metric, while the engine instruments – usually cherry-picked from various Western designs – are mostly imperial. Once seated, both the sitting position and the view ahead are pretty good, though the frame of the canopy initially gave me the impression of peering through a postbox; once on the move though, I quickly got used to it. The rudder pedals can be adjusted fore and aft, but this is generally avoided since the mechanism is known to stick. The brakes themselves are actuated by separate toe-operated paddles inboard of the pedals – a solution similar to that used on the Super Cub, where they’re heel-operated. With larger shoes (or military boots) on larger feet, this does not seem to be a particularly used-friendly solution, and it took me some fumbling and toe jabbing before I’d gotten used to it. The rudder pedal edges are also contoured to accept the outline of a thick boot – a feature not really compatible with the sneakers I was wearing that day. Helping matters however is that the brakes are quite powerful, so even a slight jab at them (regardless of its elegance) produces some results. Then there’s also the fully steerable nose wheel, which makes ground maneuvering pretty painless – indeed, I’d managed to get the hang of it after just a few dozen yards. In fact, on steering alone (without differential braking), the turn radius is just 7 meters – noticeably less than the 8.3 the Skyhawk can achieve using BOTH steering and brakes at the same time. The shock absorbers and tires make the ride quite smooth even over rough terrain, but at the same time do not let the aircraft roll to much in the turns if you keep the speed moderate (though the aircraft’s low CG position has a lot to do with this). System-wise, all pre-departure checks are no more complicated than on the 172, and follow pretty much the same pattern. Having been designed from the outset to meet the FAA’s FAR Part 23 criteria, the U-75 holds no surprises, and there’s none of the “Eastern Bloc system exotica” that its looks and origin would lead one to believe. With the engine being essentially the same as on today’s Cessna 172S (albeit with a constant speed prop), the run-up is also straightforward and over in a jiffy. As I was briefed by the instructor occupying the right seat, the standard flap setting for departure from both paved and soft fields is notch 1, which gives 20° of flap. The aircraft manual quotes a 225 meter max performance run on grass and with zero wind; however, we had the advantage of concrete and a quartering eight knot wind, so despite the 880 ft field elevation and 25° Centigrade outside, we opted for a more leisurely departure. Adding power, there’s a very noticeable swing to the left – far more pronounced than on the Skyhawk – which can be neutralized only with a large amount of right foot. What’s more, significant pressure on the pedal is constantly needed at high power, and with no rudder trim available, this tends to become wearisome after awhile (though I suspect the rigging of the tab of the vertical stabilizer was to blame for this). Being both lighter and more powerful than the 172, the acceleration was noticeably better, and with slight backward pressure on the stick we were already airborne at 110 km/h (59 kts), having used up around 300 meters of runway. Passing 50 ft, LCM club procedures call for acceleration to the U-75’s best climb speed (Vy) of 130 km/h (70 kts), retracting the flaps at 300 ft AGL and then setting maximum cruise power, an easily remembered 25″ MP and 2,500 RPM (equivalent to roughly 80% power). In this regime, the rate of climb with full fuel and two of us on board varied between 4 and 5 m/s (800-1000 fpm), but the day’s thermal turbulence made getting a constant figure impossible. Once in the cruise – in our case at 3,000 ft towards one of Maribor’s training areas – the power came back to the 65% setting of 22.5″ and 2,350 RPM, which gave a solid 160 km/h (86 kts) indicated and 169 km/h (91 kts) true. While this is not particularly impressive for the available power, the thick wing profile and large landing gear do create a quite lot of drag; increasing the power by two inches MP gave around 170 km/h (92 kts) indicated, but since we were in no hurry, I soon throttled back to best cruise and set about seeing what’s what. Sadly, the pattern at Maribor was quite crowded that day, so there was no opportunity to perform a simulated engine-out approach without inconveniencing half the sky. To compensate, the ambidextrous nature of the U-75’s flight controls had allowed me to fly most of my program with each hand in turn and judge the ease and practicality of both. In the end – though I favor using my right hand as I do at work – flying with the left is often far simpler, since all relevant controls – flaps, lights, radio – are on the right side, allowing me to push and pull everything without having to constantly switch hands. To cut to the chase without going through each maneuver separately, the handling came as quite a positive surprise – especially after everything I’ve heard said about it. The numbers themselves offer some clue to the above, as the U-75’s 65.3 kg/m² wing loading – only slightly up from the 172’s 64.4 kg/m² – promised similarly forgiving all-round behavior, while its 9.73 m wingspan – noticeably shorter than the Skyhawk’s 10.97 – bode well for rolling rates and a general willingness to maneuver. Immediately after leaving straight & level fight, I found the stick to be very precise and informative, its travel pleasingly light in both axes – enough to get a good feel for the aircraft, but not twitchy enough to become tiring. Interestingly, the stick moves noticeably lighter in roll than in pitch, a setup exactly opposite to that of a glider. Thanks to the type’s large ailerons and powerful elevator (both blessed with considerable travel), the feel was matched by the aircraft’s physical response, with rolling and pitching done quickly and eagerly – but without the aggression of a thoroughbred aerobatic machine. Unsurprisingly, rates across all three axes were significantly higher than on the Skyhawk. This harmony between stick and machine meant that I could achieve a remarkable degree of precision in most maneuvers already on the first time out, and all without any unnecessary flailing at the controls. Following my observations on take-off and in the climb, I was also quite surprised how little rudder was needed in turns – and that even left-hand maneuvers occasionally needed a poke of right rudder (though I again suspect tab rigging to be the cause). An additional characteristic that caught my eye/hand was that even in high bank turns, comparatively little backpressure was needed on the stick – and when I did find myself losing altitude, little additional force was necessary to return everything back to textbook state. As the numbers in the previous paragraph suggested, the U-75 was indeed very willing to sustain most maneuvers without much fuss and manhandling from my side, which immediately inspired a dose of confidence in its handling as a whole. But what impressed me most of all was its stall response. Given the legends, tales and accident reports relating to U-75s going vertically, I was ever so slightly apprehensive about this part – not due to fears of ending up in a spin**, but a perception that an aircraft with such a reputation will likely not be well behaved once the going gets tough. I am pleased to say that I was quite off the mark, for the U-75 had exhibited flight simulator-like behavior, even with power on: just a very slight shudder and forward tug on the stick saying that it would like its nose to point down if I don’t mind. Honestly, it made the 172 look dramatic! Another thing of note is that despite the day’s turbulent thermal weather, it resisted wiggling its wings near the stall – and as soon as it even slightly went to the side, quick pedal action would sort everything out in an instant. ** although owners who had spun the U-75 say it is not as big a deal as folklore suggests (again, if done properly), I had shied away from attempting one, due to both my lack of experience on the type – and the fact that S5-DCI itself was barred from spinning by LCM club rules. Some mention should also be made of the engine. Despite its nominal take-off rating of 180 HP, throughout the program we kept it at its 25″/2,500 RPM maximum cruise setting, which – according to the manuals – left us 150 HP to play with. Despite the abuse and the 20 °C at altitude, the engine oil temperature remained hovering around 95 °C (right in the middle of its 80-110 °C normal operating range), while the designated cylinder registered around 190 °C (deep enough for comfort within its 80-220 °C green arc) – which says a lot about the airflow through the engine compartment. Helping matters were the U-75’s distinctive cowl flaps, located on top of the cowl just ahead of the windshield, which lead to the odd situation of the front cylinders running hotter than the rear pair. Another thing of note is that despite its semi-aerobatic credentials, the U-75 sports the standard version of the IO-360, which is not equipped with fuel and oil systems for inverted flight (these would have been identified by the additional prefix AE). Criticisms? Well, the only major thorn in my eye at this time was the trim wheel, which was far too coarse and lacking in feel; it resisted operation too much and even a slight turn resulted in an out-of-proportion change in stick force. However, as with the rudder, this may very well have been down to the rigging of this specific aircraft. With the program completed, we settled back into the cruise, where the plan was for me to do some navigation of the greater Maribor area and see how the U-75 behaves en-route. In a number of critical areas, it didn’t fare all that well: its military genes mean that comfort was never allowed to compromise the training experience, the result of which is a cockpit with no soundproofing at all (as noted previously). The upshot is that ambient noise is off the scale, and even with headphones on it all becomes pretty annoying pretty quickly (especially since S5-DCI has no squelch control, which leaves the headphone mikes free to pick up the drone and amplify it back to you). 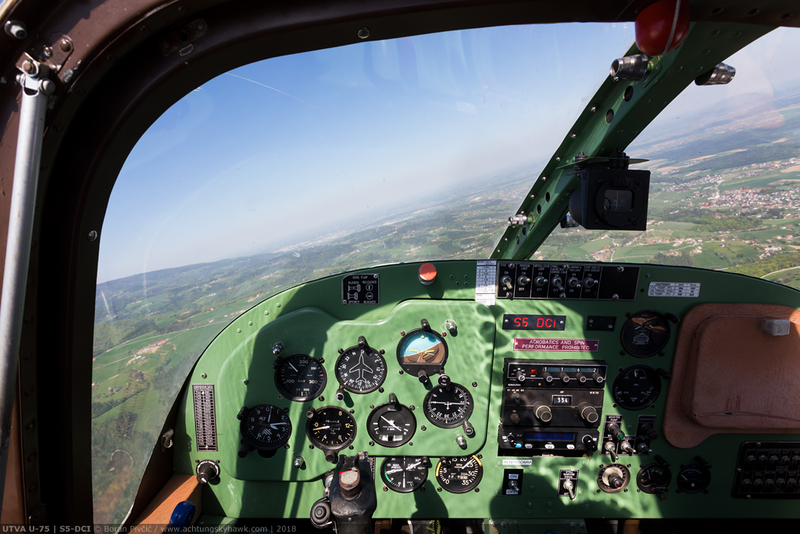 The position and height of the stick also mean that you have very little space in your lap – so with a kneeboard on and the right seat occupied, you’re going to struggle to read an unfolded map, despite the nominally generous size of the cockpit. However, as uncomfortable as it may be, the U-75 nevertheless does have something going for it as a navigation platform. In common with most other low-wing aircraft, the view outside is excellent, and the relatively small span of the wing means you can often have a good look down. Once trimmed (after much frustration), it will fly hands off for a surprising amount of time – without rudder input even – though having someone in the right seat to balance things certainly helps. More importantly, the extensive glazing means you can easily keep tabs on surrounding traffic, and it never took us long to spot neighboring aircraft without having to bank or pitch or stand on our heads. So while the average GA tourer is in a completely different league in terms of comfort – so much so you’d be excused for sending hate mail to the UTVA works following a long cross-country – the U-75 is nevertheless a practical and safe platform for finding your way around. In that other important route performance metric – fuel – the U-75 is pretty much on par with the 172, with our 65% power setting (mixture full rich) registering 30 liters/hour (7.5 GPH) on the flow meter. With the manufacturer’s 15% reserve fuel policy giving us 128 liters (34 USG) usable out of the 150 liters (40 USG) carried in total, this works out to an endurance of around 4.5 hours. At the same altitude, power/mix setting and ambient conditions, the POH for a late 70s 172N puts out a fuel flow of 25 liters/hour (6.7 GPH) which, with 136 liters (36 USG) available before hitting the 45 minute reserve, gives an endurance of 5.3 hours. However, I normally fly a 1979 Skyhawk with a very accurate digital flow meter, and the real-world figures in nearly identical conditions are all in the lower 7s, which gives an actual endurance of between 4.75 and 5 hours. A charismatic 70s Yugoslav trainer, more noise than is believable, a green ergonomic mess of a panel and a guns/rockets/bombs toggle switch on the stick – fine ingredients for a fulfilling afternoon! Despite the large canopy frame, the view out is excellent in all directions (even back), though on clear days the sun coming in through the top of the canopy does lead to sauna-like conditions. With both zone and en-route work completed, I opted for a handful of touch-and-goes, to see how the U-75 manages that most difficult of maneuvers – landing. On the first three approaches, I went with a flaps notch 1 configuration – and quickly discovered that the little Utva could out-accelerate a brick going down. All that drag means that its glide is quite steep, with the manual quoting a L/D ratio (flaps up) of just 1/6.72 at 150 km/h, 1/7.1 at the 140 km/h (76 kts) recommended engine-out speed, and just 1/8.42 at its 116 km/h (63 kts) best glide – a condition where even the unaerodynamic 172 manages 1/9.2. In our case, these figures were decidedly lower, partly due to my ham-fisted flying – but mostly due to keeping our speed high to avoid disrupting the traffic flow and potentially shock cooling the engine. The ideal speed was therefore pegged at the same 130 km/h as in the climb, which gave more than adequate circuit performance while still keeping us below the maximum flap extension speed of 140 km/h. Flying, both on and off work, a high-wing aircraft blessed with ample wingtip clearance, I was naturally apprehensive about touching down wing low in the day’s 6 knot crosswind. While this is just a light breeze everywhere else, the U-75 is deemed to be particularly sensitive to it, and is in fact limited to a 90° crosswind component of just 8 knots – HALF of the 15 knots limiting the Skyhawk. To avoid making a complete mess of it so early on, I elected instead for a jet-style crabbed approach with an appropriate bootfull just before the wheels hit the ground. The type’s powerful rudder made this a non-issue, though with experience I’m sure a proper sideslip approach could be flown easily and without danger to both the airplane and ego (especially since the 6° dihedral places the wingtip approximately 1.1 meters above the ground). Glossing over my first landing – an inglorious thump from too high a flare – I’d soon gotten my hand in and discovered that the U-75 is quite easy to land softly, mostly due to the very tolerant trailing link main gear. As can be expected, the cushioning of the low wing and a more pronounced ground effect mean you can float a long way if you’re not careful, but it doesn’t take too long to get used to it. Indeed, pilots who flew the U-75 in precision landing competitions told me that it is far easier to place on a specific spot than the 172, and it was always the preferred mount with many podium finishes. Interestingly, despite the high degree of flap, the touchdown attitude is noticeably nose up, far more than on the Skyhawk; however, the slope of the nose does not impair forward visibility at any point. The touchdown speed in our case was around 100 km/h (54 kts), though this can be brought down a bit if a greaser is not your intention. To step up the fun – and illustrate just how draggy the U-75 can be – for the next approach I was instructed to come in high, fast and close, rolling onto the runway heading just 1,200 meters away at 1,100 ft above ground, doing 150 km/h (81 kts). To reach the threshold, I’d have to fly a virtual glide slope of 16° – 10 more than the steepest ILS recognized by law. Pulling the throttle back to idle, setting the prop full fine and dropping flaps fully to notch 2 (30°), I found myself in a visually disconcerting steep descent at 110 km/h (59 kts) and slowing – eventually even having to add power just to make it to the runway. The maximum rate of descent I remember seeing was on the order of 8 m/s (1,500 fpm) with no forward acceleration. As an encore, I had planned for the final landing to be a “minimum stopping distance” affair – but the traffic crowding in behind us and the necessity of taxiing a full kilometer to our turn off point meant I had to scrub the idea and get my behind off the runway ASAP. But, since I’m already throwing numbers around, the manual suggests a landing distance over a 50 ft obstacle of around 450 meters, with the run itself just 240 meters. While the comparatively short time aloft (and my aforementioned lack of test pilot credentials) prevent me from making any worthwhile objective conclusion, from a purely subjective standpoint I was nevertheless pretty smitten with the U-75 – perhaps most of all because it was nothing like popular lore said it would be. While a pure aerobatic aircraft might have been more exciting (at least during maneuvering), the Utva is definitely not boring or dull; indeed, on fun factor alone it might even top the Super Cub and Citabria (both of which I’d had the privilege to fly). While it is not perfect – and living with its faults day to day would likely start to wear quite thin very soon – its charisma, origins and historical relevance had definitely been worth the trip! *** Simply put, to actually go somewhere, I’d undoubtedly choose the better equipped, more comfortable and far quieter Skyhawk; but to have a bit of good old fashion stick-and-rudder fun without much fuss and effort, it would definitely be U-75 all the way 🙂 . *** despite their widespread use across the width and breadth of ex-Yugoslavia, airworthy examples are nowadays increasingly difficult to find, with – by my count – less than 10 still operational and in civilian hands. 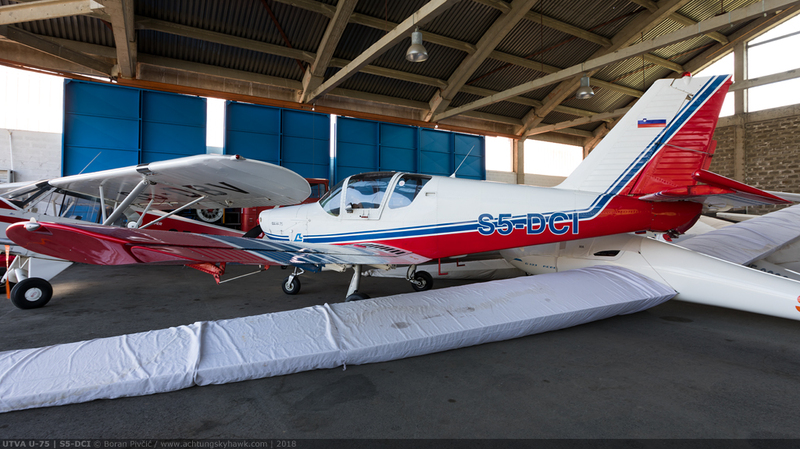 Their somewhat expensive maintenance, pretty specific role and an increasing lack of spares make them a financial handful for smaller flying clubs, while their specific character is unlikely to tempt the wallets of many private pilots and owners. Despite this, the few examples that are flying will likely continue to do so for some time to come, with one – 9A-DIH at Čakovec Airfield (LDVC) in Croatia – soon set to return to flight after nearly a decade on the ground! Pingback: Photo File – Moraning Around: Flying The Rallye 150 | Achtung, Skyhawk!